"This View, taken from the Sanctuary, gives the general effect of the Nave - with its majestic height, pointed arches, clustered pillars, and 'long-drawn aisles,'... 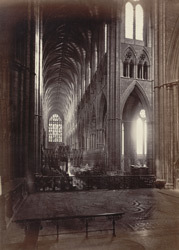 The breadth of the Nave Aisles is 16 feet 7 inches. The balance of height and breadth in these Aisles is particularly effective, as is also the vaulting of the roof." Westminster Abbey was founded by Edward the Confessor and was consecrated in AD1065. It was rebuilt in the 13th century in the French gothic style, with a nave of great height, flying buttresses and rose windows. The monastery was dissolved by Henry VIII in 1540 and the abbey became the cathedral of the new diocese of Westminster. Most British monarchs are buried here and it has been the crowning place for all sovereigns since the 11th century.